Many chemical elements that present in the human diet are essential for human life at low concentrations but can be toxic at high concentrations and chronic exposure. We aimed to assess the levels of some heavy metals in canned food that are sold in the Palestinian market and compare them with the recommended international limits. A total of sixteen canned food samples were collected. The samples included four different manufactures for each of beans, chickpeas, corn and mushroom. After homogenization and samples treatment, the concentrations were determined using flame atomic absorption spectrometer IcE-3000 SERIES. The concentrations were found to be in the range of 0.089–1.17 mg/L for Pb, 0.019–0.32 mg/L for Cd, 2.05–10.6 mg/L for Zn and 0.79–3.97 mg/L for Cu. Cadmium and copper results were higher than the maximum permissible limit (0.006 and 0.9 mg/L, respectively), whereas lead (except for only one sample: marina corn) and zinc levels were within the maximum permissible limits (1 and 11 mg/L, respectively). The results necessitate continuous monitoring of Cd and Cu levels and controlling of canning process to obtain food safety. As an important environmental health concern, we recommend future human biomonitoring studies to correlate environmental exposure of these elements to biological markers. One of the most important environmental health issues facing the world nowadays is contamination of the environment by inorganic, organic and organometallic materials. There has been growing interest in the monitoring of heavy metals in the bio-organs . The main source of exposure of humans to heavy metals is through ingestion of food. Many chemical elements that are present in the human diet are essential for human life at low concentrations but can be toxic at high levels and chronic exposure . Lead and cadmium are from the prevalent toxic elements in food and environment that have a long half-life after absorption. In humans and animals, they can make unpleasant effects such as damage to internal organs. Cadmium accumulates in the human body and especially in the kidneys which could lead to dysfunction of the kidney with impaired re-absorption of some molecules such as: proteins, glucose and amino acids . Exposure to lead could cause many adverse health effects, including: hypertension, gastrointestinal effects, anemia, nephropathy, decreased growth, immune and nervous systems dysfunctions, some behavioral/cognitive disabilities, hearing loss and effects on reproduction . Copper and zinc are known to be essential and may enter the food materials from soil through mineralization by crops or environmental contamination with metal-based pesticides. The adult human body contains about 1.5–2 ppm (parts per million) of copper  and 33 ppm of zinc. Excessive intake of either copper or zinc has been reported to be toxic . Heavy metal ions are essential micronutrients for plant metabolism but when present in excess, can become extremely toxic. Heavy metals are dangerous because they tend to bio-accumulate . Copper and zinc are essential micronutrients if consumed in adequate amounts, but they might become toxic when consumed excessively. In contrast, cadmium (Cd) and lead (Pb) are toxic metals and are harmful at low concentration and are not easily biodegradable . Therefore, it is important to assess the concentrations of these metals in the human food chain as environmental exposure assessment technique in order to evaluate their actual concentrations in the environmental medium (food) and whether these concentrations perform dangerous effects on the consumers when compared to the reference permissible values. This would further suggest a preventive measures and alternatives to these food sources with the policy and decision makers at the national level. A total of 16 canned food samples including beans, chickpeas, corn and mushroom were collected from a popular supermarket in Nablus city. We have chosen randomly four companies of each product. The different samples were transported to the chemistry laboratory at An-Najah National University and stored in a clean dry place prior to the digestion and analysis. Each can was opened and the contents were mixed in blender and homogenized. We weighted 5 g of each can content and transferred it to 100-mL flask. In fume hood, we added approximately 5 mL of concentrated HNO3 (Riedek-de Haen No. 30713) and heated that with Bunsen burner until first vigorous reaction (black residue appeared). Then, 2 mL of H2SO4 (batch no: P110001671) was added with continuous heating, maintaining oxidizing conditions by adding concentrated HNO3 in small increments until the solution became clear (yellow–orange) and no solid residue remained. A total of 25–30 mL of HNO3 was added, and this took 1.5–2 h for each sample. Then, the solution was transferred to 50-mL volumetric flask and rinsed appropriately to ensure quantitative transfer of the sample. Then, it was diluted with distilled water to 50 mL. All the plastic and glassware were cleaned and rinsed with distilled water prior to use. The stock solutions were prepared by taking the required amounts of Pb (NO3)2 salt (1.598 g), cadmium salt (0.27 g), ZnSO4·7H2O salt (4.397 g) and CuNO3 salt (0.465 g) and dissolved in deionized water to give 1000 mg/L standard solution. Flame Atomic absorption spectrometer IcE-3000 SERIES, Serial number c113500021 designed in UK AA Spectrometer with a hollow cathode lamp for Cadmium, Lead, Copper and Zinc was used. The wavelength, slit width and lamp current of each metal were adjusted according to the description given in the manufacturer manual for determination of Cd, Pb, Cu and Zn . The calibration was performed by introducing water as blank to adjust reading of the instrument. Stock solution was used to prepare different concentrations 0, 2,5,10 and 20 mg/L of heavy metals Cd, Pb, Zn and Cu. 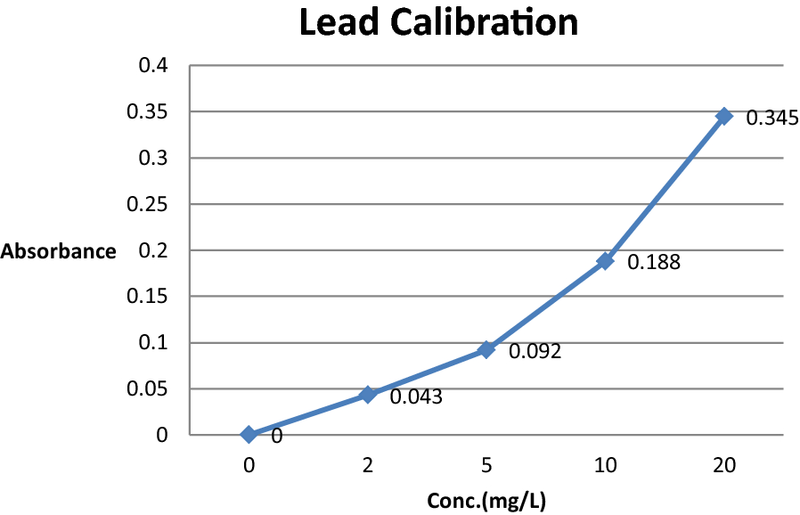 The calibration curves were constructed by plotting values of absorbance versus concentration, as shown in the following figures (Figs. 1, 2, 3, 4). After calibration, we introduced each sample into the instrument recording the steady reading obtained, and then the apparatus was washed after each introduction with water as a blank solution to check that the reading returned to its initial setting. The results are based on three repetitions of the experiment for each canned product. The samples origins are shown in Table 1. The canned food sources were from five different countries: Thailand, China, United Arab Emirates (UAE), Jordan and Palestine. Table 2 and Fig. 5 show the concentrations of all measured elements in the study among all canned food origins. As shown, chickpeas had the highest average concentration of Zn followed by canned beans, while mushroom had the lowest average concentration of Zn. Regarding Pb, it was found that canned corn had the highest average concentration while beans the lowest. In addition, mushroom and chickpeas had nearly the same approximate Pb levels of concentrations. However, canned beans had the highest concentration of Cd followed by canned chickpeas, but corn and mushroom had very low concentrations of Cd. Canned beans also had the highest concentration of Cu. In contrast, canned corn had the lowest while chickpeas had higher concentration of Cu than mushroom. 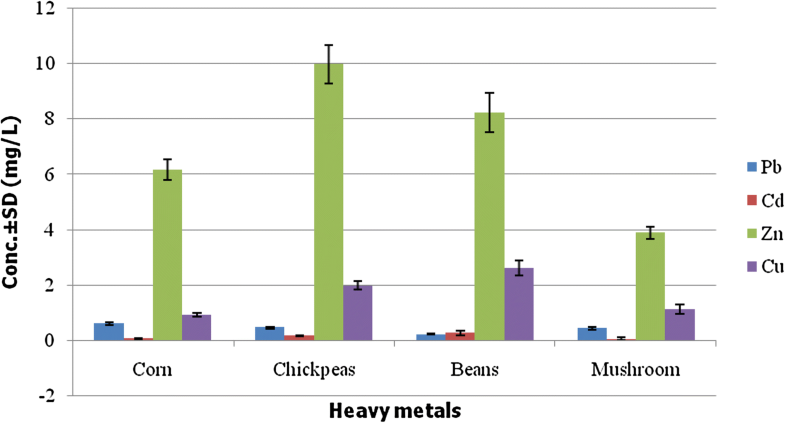 In this study, we assessed Pb, Cd, Cu and Zn in canned foods which include corn, chickpeas, beans and mushroom that are sold in the Palestinian market. Environmental pollution with heavy metals and its effects on human health have been considered as important issues all over the world. Minerals are important components required by humans in our daily food need. These include more than 22 mineral elements; some of them are required in large amounts such as: calcium (Ca), magnesium (Mg) and potassium (K). But others such as Cu and Zn are required in trace amounts because higher concentrations can be harmful . The contents of investigated metals in canned food were found to be in the range of 0.089–1.17 mg/L for Pb, 0.019–0.322 mg/L for Cd, 2.05–10.6 mg/L for Zn and 0.79–2.97 mg/L for Cu. According to these data, Zn had the highest concentrations, followed by Cu and then Pb. The lowest metal level concentration was Cd. Cadmium had no known biological function in humans; it almost accumulates in kidneys and liver, and also it has long half-life (4–19 years) . In our study, the highest concentrations of Cd were in “kaseeh” canned beans (0.322 mg/L) and these results agree with a previous study that reported Cd in Fava beans level as (0.483 μg/g) . On the other hand, the lowest concentration of Cd in canned beans was in “Delmonaty” 0.23 mg/L and this is higher than levels of Cd reported in Radwan and Salama  in legumes at the range of 0.01–0.178 mg/kg. Mushroom had generally low concentrations of Cd (0–0.065 mg/L) in comparison with all canned foods in our study, and these results almost agree with Abdelwahab et al. results who reported (not detected) levels of Cd in canned mushroom. High concentrations of Cd were detected in the present study for canned chickpeas (0.208 mg/L for Americana, 0.166 mg/L for Kaseeh, 0.207 mg/L for KfrQare, 0.100 mg/L for Affoleh), and these results disagree with Abdelwahab et al. that reported (not detected) Cd levels in canned chickpeas. In contrast, our results agree with other studies levels of Cd which were reported as 0.125 μg/g in canned chickpeas . Lead is toxic metal and even in low concentration. It causes health hazards since it is not biodegradable and it may cause kidney damage . The presence of Pb in canned food may due to use of Pb in product package materials or due to absorbed lead by plants in limit level . In general, beans had the lowest concentrations of Pb in comparison with canned food types and this agrees with a study conducted in Riyadh to measure Pb levels in canned beans which were reported to be 0.019 μg/g . Our reported levels of Pb in marina corn (1.17 mg/L) which was produced in Thailand were higher than those indicated in Abdelwahab et al. study for sweet corn (0.75 ppm). In contrast, our reported results for Pb in mushroom (0.549 mg/L for Big Sea, 0.293 mg/L for Marina, 0.439 mg/L for Sahten o Afia, 0.454 mg/L for Americana) were lower than levels reported in Abdelwahab et al. which were 1 ppm. In a study conducted in Saudi Arabia  to measure heavy metals in fresh and canned food, the highest level of Pd in canned food was 7.11 mg/kg which was very high in comparison with our results (1.17 mg/L in marina corn). Furthermore, lead was determined in legumes in a study performed in Egypt . The results showed that the levels ranged from 0.013 to 0.281 mg/kg, which were lower than our results in chickpeas (0.127–0.756 mg/L) but approximate to our beans results (0.089–0.35) mg/L. Copper is known as vital and toxic for many biological systems and may enter food from soil through mineralization by crops, food processing or environmental contamination, such as copper-based pesticides . The minimum copper value in our study was found to be 0.793 mg/L for “Freshly” corn and maximum value as 3.25 mg/L for “Americana” beans. Our results for copper were low in comparison with other studies which reported a concentration of 4.8 μg/g in mushroom, 3.52 μg/g in corn and 7.77 μg/g in canned beans . Copper value in canned food in a study performed in Saudi Arabia reported a range level of 6.22–8.03 mg/kg, which was very high in comparison with our results (0.79–3.97 mg/L) , whereas in a study conducted in Lebanon, Cu concentration was reported as not detected in chickpeas, mushroom and fava beans . Zinc is one of the most important trace metals for normal growth and development of humans. Deficiency of zinc can result from inadequate dietary intake, impaired absorption, excessive excretion or inherited defects in zinc metabolism . Zinc had the highest levels in the present study. The maximum level of Zn was in chickpeas with average of 9.9 mg/L, and lowest in mushroom with average of 3.89 mg/L. These results disagree with other studies  which reported that mushroom had the highest levels of Zn (21.9 μg/g) followed by beans (12.8 μg/g) and corn (8.5 μg/g), while Zn levels in our study were 6.17 mg/L for corn and 8.2 mg/L for beans. The present study reported a range of 2.05–10.6 mg/L of Zn in all food samples, whereas it was almost lower than levels of Zn reported in other studies with a range of 6.11–15.86 mg/kg in legumes  in contrast to the study performed in Lebanon which reported Zn concentration as not detected in the canned food . The ATSDR stated that the chronic durational oral minimal risk level (MRL) for Cd is 0.1 μg/kg/day based on its renal effect . A 60 kg person needs 6 μg/day to reach the permissible level. Cd range in our study was 0–0.322 mg/L, which was higher than the maximum permissible limit (0.006 mg/L) . Therefore, canned food may harm human health in chronic use, and this may be one of the risk factors for kidney diseases in the society, because Cd had a very high effect on kidneys, and this is an alarm in public health for kidney diseases. Expert Committee on Food Additives has suggested a provisional tolerable intake of 400–500 μg Pb per week for man . However, the Food and Drug Administration (FDA) has set an action of 0.5 μg/mL for Pb in products intended for use by infants and children and has banned the use of lead-soldered food cans . The Food and Agriculture Organization (FAO) has set (1 mg/kg) as maximum level of lead in canned food . In our study, the maximum level of lead was 1.17 mg/L in marina corn, which is higher than the maximum permissible limit of Pb in canned food (1 mg/L). But the other samples were below the permissible limit . The recommended dietary allowance (RDA) of Cu is 0.9 mg/day for adult which has been recently published by the ATSDR . Our Cu range was 0.7–3.25 mg/L which is higher than the maximum permissible limits, and this is an important result in the time that excessive levels of copper can result in a number of adverse health effects including liver and kidney damage, anemia, immunotoxicity and developmental toxicity . The Food and Nutrition Board of the Institute of Medicine in Washington DC has developed recommended dietary allowances (RDAs) of 340 μg of copper per day for children aged 1–3 years, 440 μg/day for children aged 4–8 years, 700 μg/day for children aged 9–13 years, 890 μg/day for children aged 14–18 years . The maximum permissible limits of zinc in food as reported in ATSDR are 8 mg/day for female and 11 mg/day for male. In our study, concentration of zinc range was 2.058–10.65 mg/L which is higher than maximum permissible limit [17, 22]. Lead and zinc concentrations in our study were within the international maximum permissible limits, but cadmium and copper levels were higher than international maximum permissible limits, and this is an important environmental health concern for food safety and heavy metals accumulation in the human body. This study has some limitations. Samples selection could limit our study. However, in Palestine, the selected canned foods are used on daily basis when preparing the Palestinian meals. Therefore, we were interested in these types of food. Furthermore, we have identified all companies that manufacture each of the selected canned foods, and then we have chosen randomly four companies of each product as we could not have been able to go through all companies in the laboratory analysis due to resources limitations. Despite this, it should be noted that the best number of samples should be more than 16 samples. However, this study could be considered as a baseline one in Palestine and our future studies will be expanded to more number of samples. Selection of one site for the samples collection is clarified by that most of food and cans that come from overseas are sold to all supermarkets in Palestine. The same brand and cans are always found in any supermarket in Palestine. That’s why we went and purchased them from over there. For the average of expiration dates in our samples, it was around 6–18 months. Sometimes, it takes time to import those foods from origin and by the time the supermarket receives them. Other limitation was that we tested metal cans only. Therefore, other types of canned food such as plastics could have different levels of heavy metals. It is noteworthy that there was air condition in the supermarket and this means that temperature was approximately 25 °C. Further limitation of this study was that we did not assess or correlate the environmental exposure levels of canned food elements with human biological biomarkers or adverse effects. Therefore, conclusions whether these levels were toxic at the biological levels should be drawn with caution as we only assess some exposure concentrations of which they might be different when reaching the human body. We recommend future human biomonitoring studies to correlate environmental exposure of these elements with biological markers. HA and SJ designed and coordinated the study protocol and drafted the manuscript. GS collected and analyzed the data and helped in drafting the manuscript. All authors read and approved the final manuscript. HA is an assistant professor in Public Health and the head of Public Health Department and coordinator of the Master of Public Health Program at An-Najah National University. GS is holding a MPH degree and has a BSc in Pharmacy. SJ is a professor in chemistry at An-Najah National University and has a strong and wide range experience in chemical analysis and a leading role in different laboratory analysis techniques. The authors would like to thank An-Najah National University administration for the permission to conduct this study in the university laboratories. We are grateful to the technicians in the chemistry laboratory at the Faculty of Science for help and assistance. This study did not involve human or animal subjects. The IRB committee at An-Najah National University gave waiving of IRB. Analysis and materials used in this study were provided from the chemical laboratories in the faculty of science at An-Najah National University. Thermo Fisher Scientific-AAS Methods Manual 2008: Thermo Fisher Corporation© 2008, Registration No. 441506. www.thermo.com. Accessed 18 Aug 2015. Agency for Toxic Substances and Disease Registry (ATSDR). 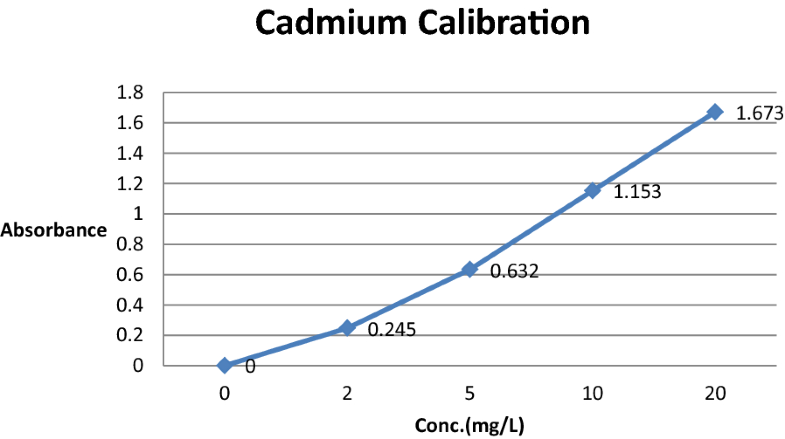 Cadmium Toxicity. http://www.atsdr.cdc.gov/csem/cadmium/docs/cadmium.pdf. Accessed 18 Aug 2015. Agency for Toxic Substances and Disease Registry (ATSDR). 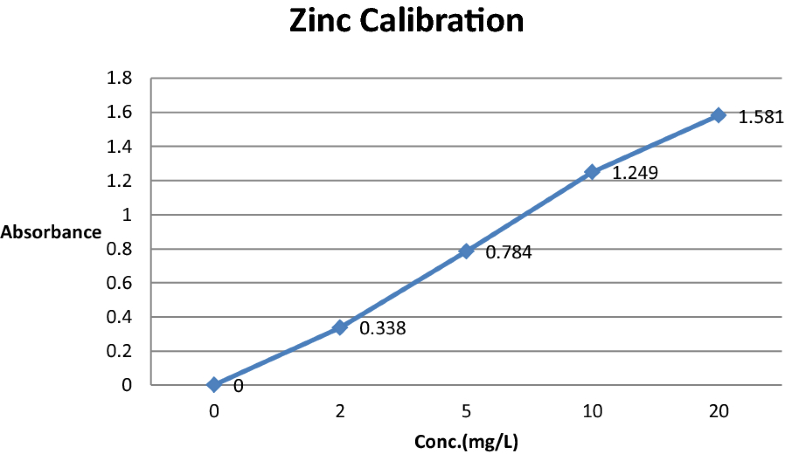 Toxicological profile of zinc. http://www.atsdr.cdc.gov/toxprofiles/tp60.pdf. Accessed 19 Aug 2015. Agency for Toxic Substances and Disease Registry (ATSDR). Publi health statement, Lead. http://www.atsdr.cdc.gov/ToxProfiles/tp13-c1.pdf. Accessed 18 Aug 2015. Agency for Toxic Substances and Disease Registry (ATSDR). 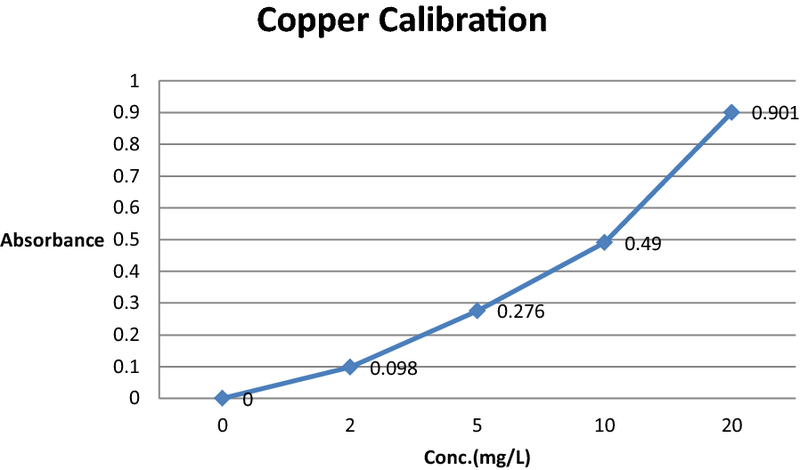 Toxicological profile of copper. http://www.atsdr.cdc.gov/toxprofiles/tp132.pdf. Accessed 23rd Aug 2015. Agency for Toxic Substances and Disease Registry (ATSDR). C766: Public health statement of Zinc. http://www.atsdr.cdc.gov/ToxProfiles/tp60-c1-b.pdf. Accessed 20 Aug 2005.